Adjectives are words used to describe something. Kids practise nouns that are described by different adjectives in this out-of-this-world sorting game. 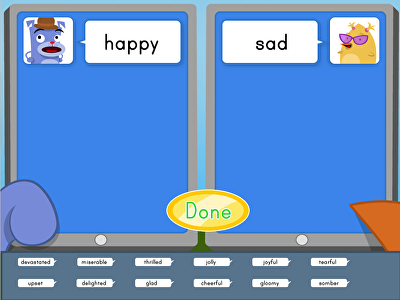 In it, children read the adjective at the top of each word transporter machine, and drag the adjectives that describe them into each machine. Compound words are created when two words are put together to make a new word. In this fishy word game, kids must combine two words to make a compound word. Every time they create a compound word, a new fish is created for Roly's supper. Be sure there are no small words left over; each batch of fish should be completely paired up. How do you describe an elephant? 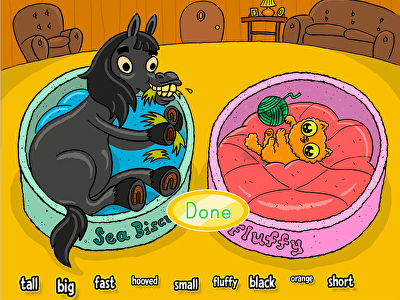 In this animal adjective game, kids use a word bank to accurately describe two animals. 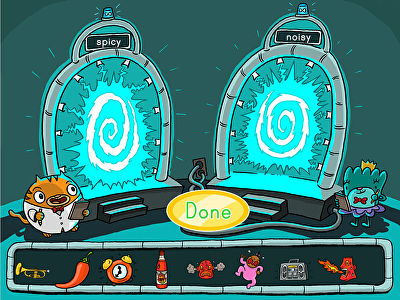 Great for building vocabulary, this interactive game helps kids practise using new words and strengthens their understanding of adjectives, all using silly artwork they'll love. Roly's hungry for fish, but only likes to eat them whole. 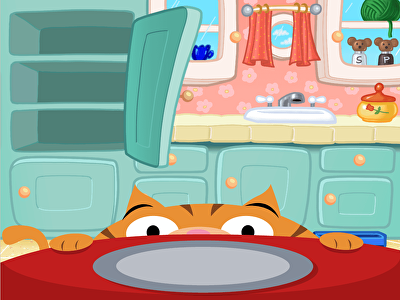 Help him get his supper by building words! Kids must combine prefixes and suffixes with root words to create whole fish. Prefixes and suffixes a critical skill that kids use to understand the meaning behind new words and strengthen reading comprehension skills. Sentence clues can help us identify synonyms, or words with similar meanings, to learn what new words mean. 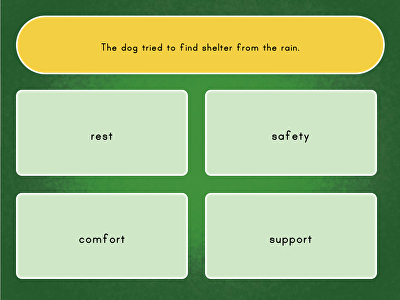 In this interactive quiz, kids use sentence clues to identify the meaning of new words. Strengthening this essential skill now will help young learners apply it to any text, expanding their vocabulary every time they read! She was happy, thrilled, and delighted to go to the amusement park! Many words mean almost the same thing, and can be used interchangeably to make writing sound more interesting and less repetitive. In this texting game, kids identify words with similar shades of meaning to build their vocabulary, knowledge of synonyms and to make them better writers. Guided Lessons are a Premium feature. Upgrade to get unlimited access to all of our lessons. Upgrade to a premium membership to get all the printables that go with this lesson.